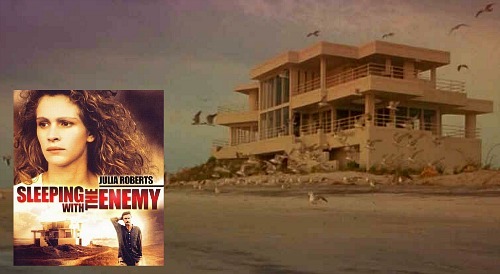 When Julia Roberts fakes her own death in the 1991 movie Sleeping With the Enemy, she flees this contemporary Cape Cod beach house where she had lived with her abusive husband, played by Patrick Bergin. Just like her marriage, this house looks good at first, but we soon learn that it’s a kind of isolated prison for her. Tortured wife Laura Burney spends a lot of time looking out at the ocean. Later in the story, we learn that it’s because she is planning to escape in it. This Cape Cod beach house isn’t really on the East Coast. According to several sources, the exterior was the Shell Island Resort Hotel in Wrightsville Beach, North Carolina. They say it was shot from angles that obscured enough of the building to make it appear to be a house. It’s hard for me to believe any kind of angles could make this look like the house in the movie. 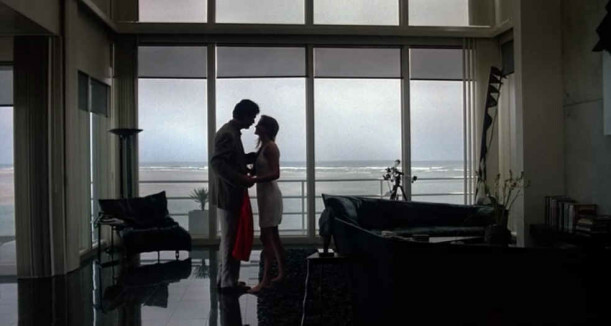 A reader named Evie insists a single-family home was used for exterior shots, not the resort. She adds that it still stands on Figure Eight Island near her family’s beach house. Thanks to Mike in NC for passing these photos along! 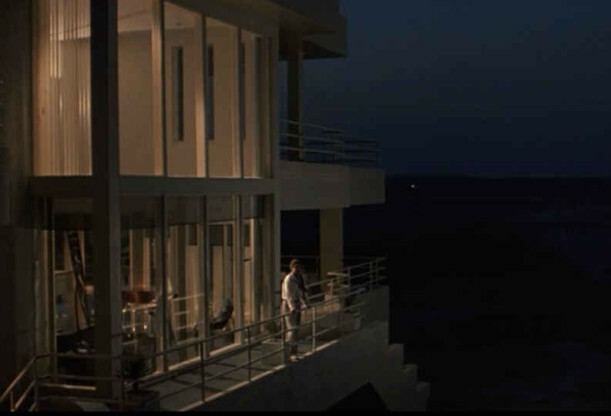 A beach house was built from scratch for the film ‘Sleeping with the Enemy.’ Whitlock writes that the entire design concept for “Sleeping with the Enemy,” kudos for which go to production designer Doug Kraner, was centered on the notion that the film would be divided visually into two worlds: Laura’s secluded life at the beach house with her abusive husband, and her “new” life in a small town in Iowa with Ben, the painfully dorky drama professor. I kept having questions, such as: (1) If the wedding ring is still in the bottom of the toilet, does that mean the toilet hadn’t been used for weeks? (2) How did the woman in the YWCA class get Bergin’s number at work? (3) How did Roberts pay her mother’s nursing home bill in the six months after she told her husband the mother was dead? (4) How did Bergin know where Roberts lived before she led him there? (5) How is it possible, in a small house, for a man to avoid discovery while slinking around rearranging all of the towels and canned goods? (6) Why would he bother, anyway? I hated that movie. Part of it is because I’m not a fan of Julia Roberts. Amen! I don’t know if I’d hate the movie or not — I refuse on principle to see any movie with Julia Roberts, because I simply can’t stand her, her ginormous mouth, and her gigantic nostrils. Ick! As to the beach house — definitely not anything I’d like. I prefer a Victorian-esque Cape May-ish looking house. I didn’t care that much for the movie, either; not because of Julia Roberts, though. It was just that there were, as Roger Egbert said in his review, too many holes in the plot. As for the beach house, it didn’t appeal to me at all. I thought that was a scary movie and this beach house looks scary, too. The Iowa house is more my style. I remember wondering how someone could hide in that house without her knowing it. I do like Julia Roberts, though. I also prefer the Iowa house – even though I like being near a beach,this house is wayyy too modern and clinical-looking for my taste. I loved the setting of this house, but the house itself seemed very dark and depressing. Of course, it was planned that way to set the mood. I’m always astounded that so much money goes into movies. They built it specifically for the movie, and then demolished it?! It seems like such a waste. This is definitely the type of house I’d love to get my hands on, and transform it from dark and gloomy to light and cheery. not my favorite movie of her’s. it’s so hard to watch abusive sitations. i liked the victorian house better. I’m with Mary, it’s too cold. But the view is amazing. The outdoor shot is awesome. What a great space! The movie though, not so much my genre…, but I did watch it to the end anyways. Go figure. Can I get the cottage from Iowa on the beach??? I haven’t seen the movie and the house doesn’t look spooky to me at all. But now I’m curious how that might change when I do see the movie! 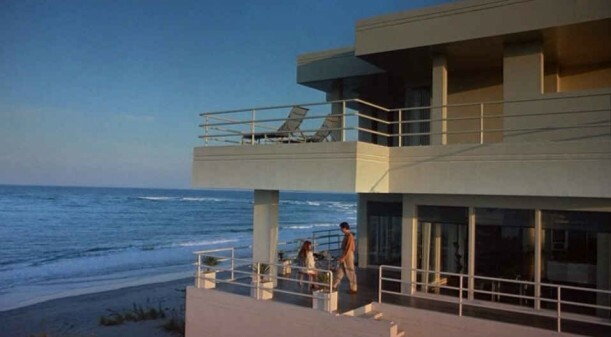 By the way, I do like the house since, well, what’s not to love about any beach house, but I don’t like everything about it. 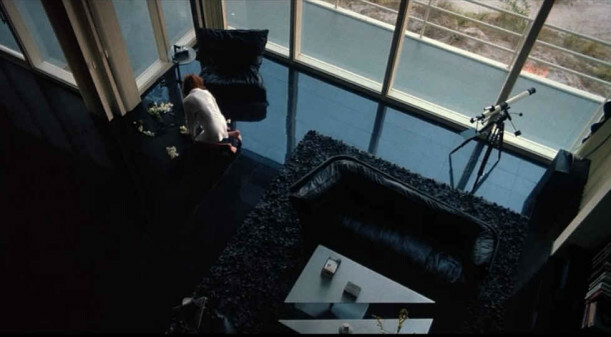 That floor is way too shiny, for example, and the place feels a bit too modern for me. 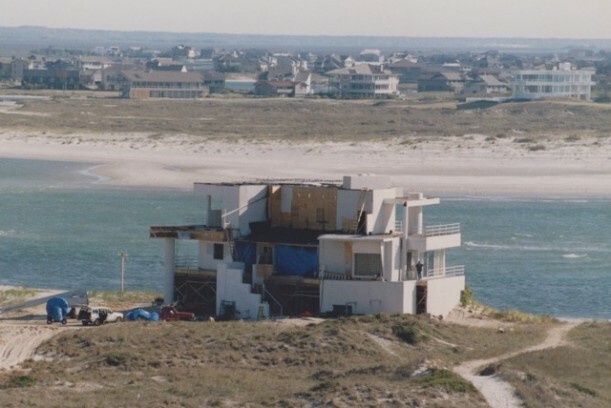 There is a book called “Cape Fear Beaches” that has a picture of the woman who owned the land the beach house sat on, sitting on the set of the beach house. 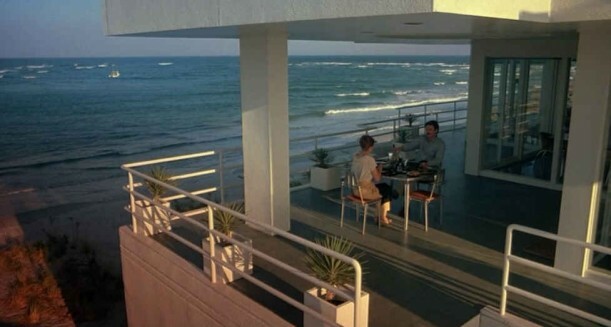 It says that it is “at the north end of Shell Island.” I believe that the beach house was a set that was built right above the Shell Island Hotel and was torn down after the movie. Being as it looks to have been on a point of an inlet and the ocean (I studied the movie way too much when researching the other house), if the house still existed, it would have been an easy house to spot but I could not find any houses like it so close to the beach or waterway to have been it. 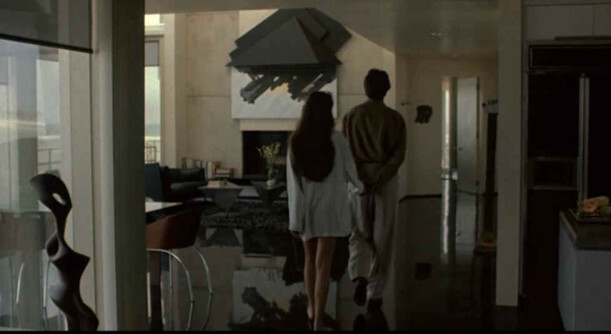 I thought the movie was scary and creepy and I thought the set folks did an amazing job creating that ambiance while still making the house seem realistic for living. Of course, I loved the little cottage, as comfortable is definitely my way of living! Great post! This house was so cold and overbearing. Very much like Roberts’ abusive husband. That being said I know a lot of people that like the OCD, austere beach house. Bethenny Frankel is one of them, and my hair stylist is another. I’m off to send him the link to this now! P.S. Lined up hand towels and cans STILL freak me out to this day. Ebert raised a lot of excellent questions with his movie review. I’m not a big fan of the Beach house at all. It does have that abusive feel to it and I haven’t seen the movie. I definitely like the victorian home so much more. The setting/lighting for this part of the movie was perfect. The house seems very cold and creepy, just like her abusive husband. The one part about this movie that always bugs me – why couldn’t she just wait and dispose of the ring later or at least toss it in the ocean? I was mad at that ring too. Mysterious…Roger Ebert’s questions are interesting. Great post. A little scary before bedtime though. It would be interesting for you to do a post on how production crews build an entire house just to destroy it after filming is done. So much work involved! I would love to see pictures of the process. My parents bought a cottage at the Cape 40 years ago, and when I saw this movie, I knew it was NOT the Cape. Can’t fake it…so why bother????????? 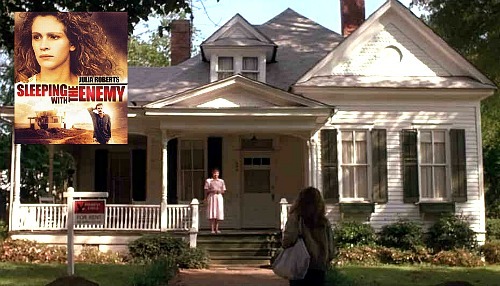 I live in Wilmington where this movie was filmed! Another interesting house is pictured here as well. If you look at the picture of the back of the fake house, look across the water and to the far right. The white house similar to this fake one was used for scenes from Weekend at Bernie’s. It is located on Figure Eight Island which is a private island where many famous people have vacationed! I lived at Wrightsville beach when this was filmed. The “house” was actually built a few yards north of the Shell Island Resort. But Elle Decor might need a geography lesson, too. Wrightsville Beach is indeed actually on the East Coast. Who does their writing? Julia Roberts is stunningly beautiful and I enjoy all her movies. No need for haters to bash her. I live in NC just a short distance from Wilmington and Figure Eight Island and have spend many great times at Shell Island Resort located at the north end of Wrightsville Beach which about as far East Coast as you can get. 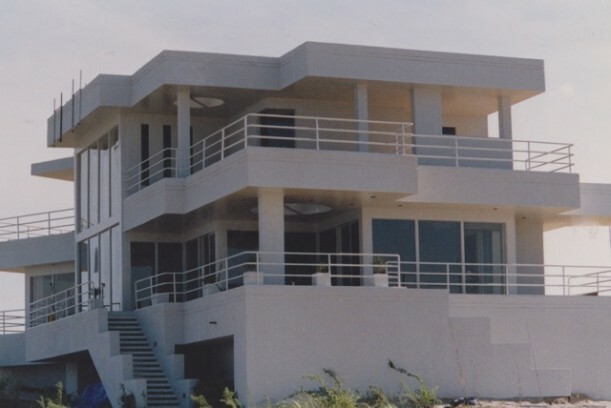 Figure Eight Island is an exclusive island of very wealthy beach homes and is restricted from general public access. 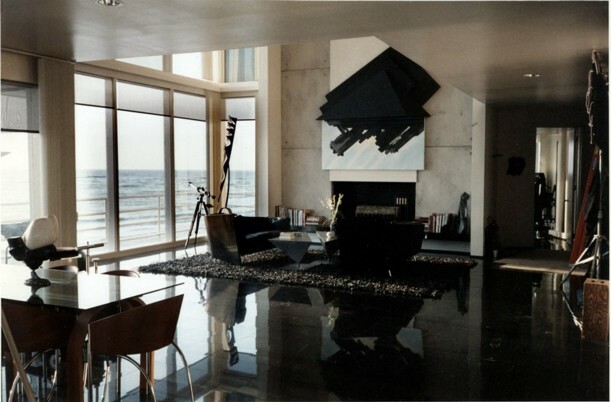 Although I could live in either house, I would definitely choose the contemporary beach house. I would desire a housekeeper though to keep those floors shiny and dust free; and keeping all that glass crystal clear from sea mist could really be a challenge! It looks like a lot of expense went into building the set. I wonder why they didn’t just finish the house throughout then sell it after the movie was finished. I read above where the land was owned by a lady. I’m sure she was paid well for the use of the land but could have probably made millions selling a famous movie house. The Victorian house was not in Iowa. It is in Abbeville,SC. I know. I watched the filming there. Beautiful historical town in the upstate part ofSC. Since when is North Carolina, which borders the Atlantic Ocean not on the East Coast? I just meant it is not really in Cape Cod. Poor word choice on my part!